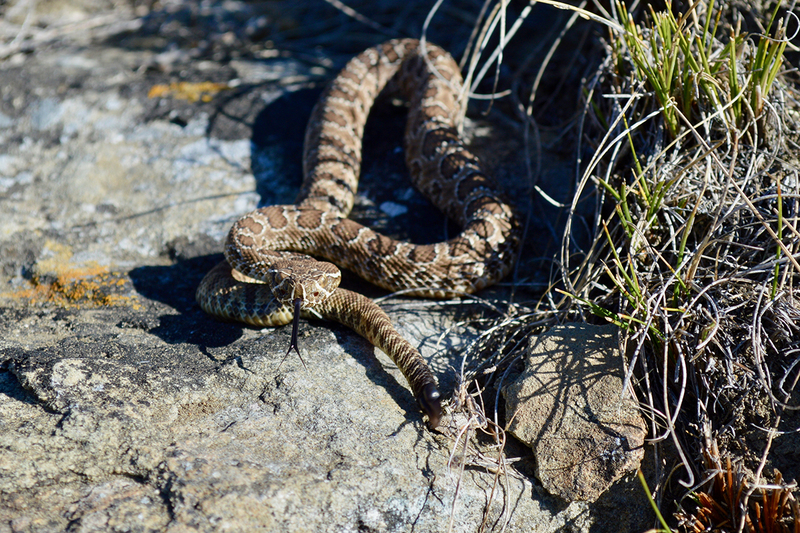 A newborn prairie rattlesnake is found basking with a large female. 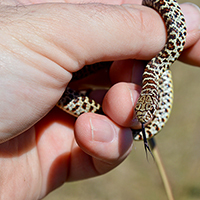 Mark Davis handles a feisty bullsnake. 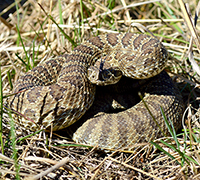 Rattlesnakes, racers, bullsnakes and other species overwinter together in the same hibernaculum. Counter to instincts, I take a step toward a clump of vegetation where I think the sound came from. I'm closer, but still can’t put my eyes on the origin of the all-too-familiar sound. Two more steps. A small male prairie rattlesnake coils defensively and flicks its tongue to assess the threat. Too close! 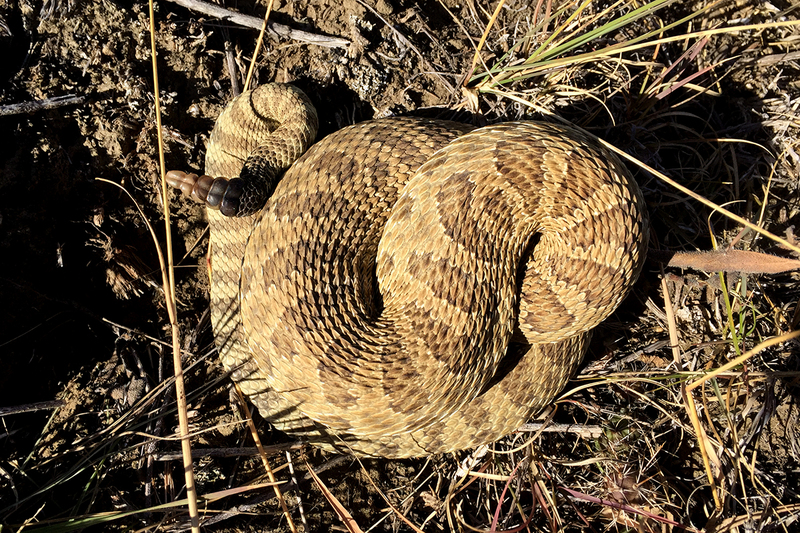 In a tuft of buffalo grass, I see a small prairie rattlesnake coil up and buzz, poised to strike at me if I get one centimeter closer. His yellow stripes, dark brown blotches and drab green base-color render him nearly invisible in the brown, green and yellow prairie. I carefully survey the scene, making sure there are no other serpents silently soaking up the autumn sun nearby. Once I'm sure he’s the only one, I pick him up with my snake tongs and place him gently into a bucket. 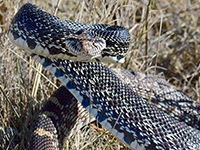 I look for a stable, level and sheltered piece of prairie where I can safely collect data on the snake. The colors of this yellow-bellied racer mimic those of a young prairie rattlesnake. I'm in the Badlands of North Dakota with my colleagues, professor Matt Smith of North Dakota State University and Stephanie Tucker of North Dakota Game and Fish. 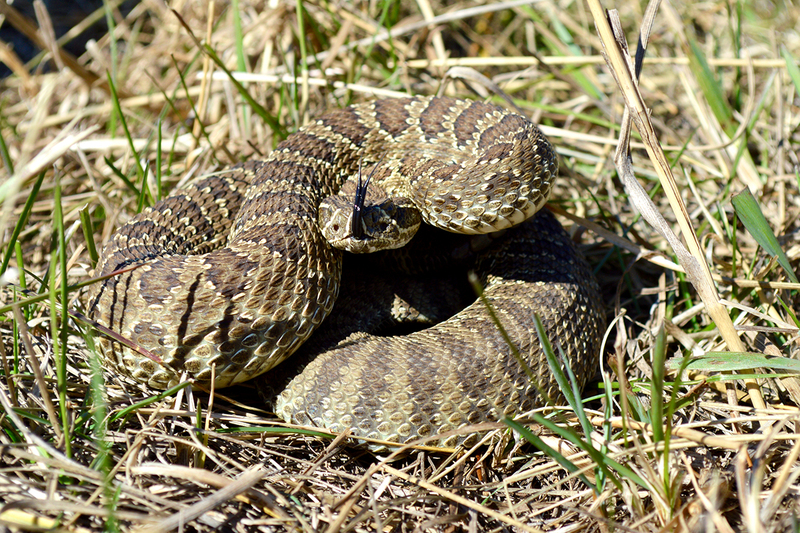 We are surveying prairie rattlesnakes for a collaborative research project. 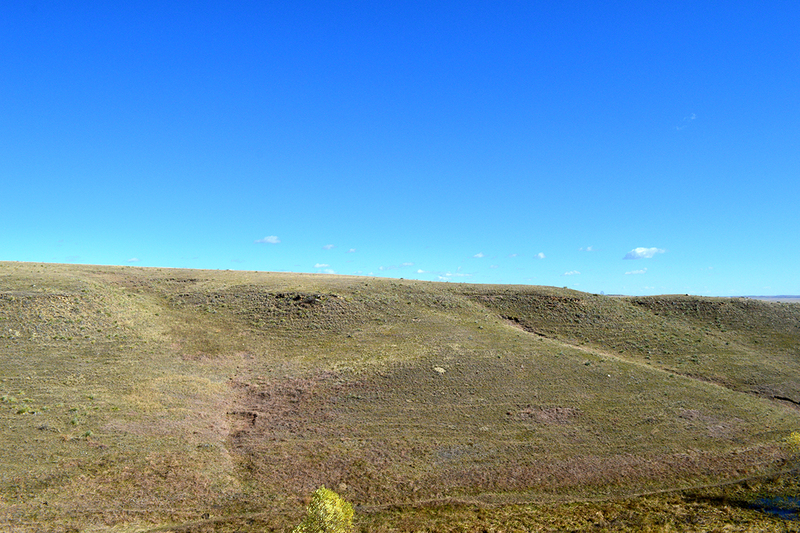 Today, we are visiting a traditional snake hibernaculum – a rock outcrop on a butte in which generations of snakes have come to spend their winters, deep beneath the frigid North Dakota surface. I coax the angry little snake into a clear plastic snake tube so that we can collect important life history data and draw its blood. This will allow us to conduct genetic analyses on the Badlands snakes. With the business end of the snake safely secured, my colleagues and I set to work. 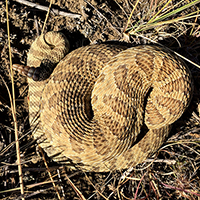 When confronted with danger, some rattlesnakes tuck their heads under their coils and wait for the threat to pass. We measure, count, probe and needle the snake, jotting down all kinds of information. 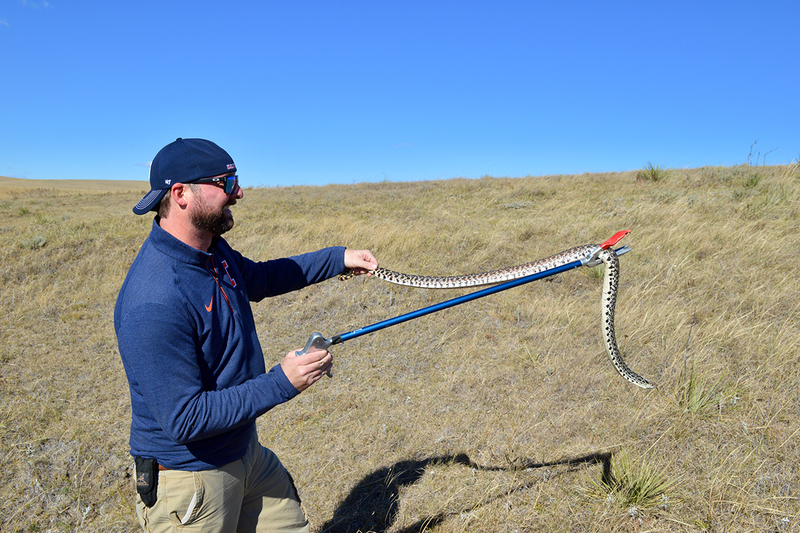 I know the data will help us learn about how these snakes came to exist in the Badlands and understand what challenges they face in a rapidly changing world. I hope the information we gather today will help this important component of the Badlands ecosystem to persist into the future. Once we’re done, I return the feisty little snake to its original patch of prairie. He quickly coils and raises up defiantly, rattling loudly, poised to strike, all while slowly backing away until he can find asylum in a safe mammal burrow or rock crevice. Rocky outcroppings on steep hillsides and buttes are ideal habitat for rattlesnakes in the Badlands. This afternoon, we catch four more large adult rattlesnakes and two baby rattlers. 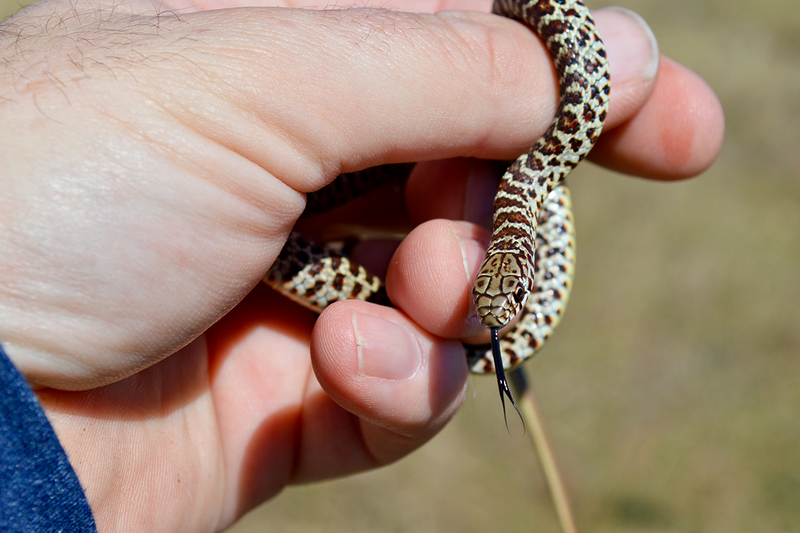 We also find hatchling yellow-bellied racers and a massive, angry bullsnake. She behaves just like a rattlesnake to try and fool me into leaving her lie.